The biggest perk about cooking your meals at home is knowing absolutely EVERYTHING that goes into your food. So many times restaurants will add extra salt, sugar, and oil. And why not? They aren’t concerned with your cholesterol. But, if you do the cooking you can choose whole grains, lean meats and fish, low fat dairy, little or no salt and even fresh vegetables from your garden. You can choose the healthier method to prepare, too. Bake your chicken instead of frying it, and for extra calorie busting take the skin off before you bake it. Invest in one of those fat draining indoor grills and watch the fat drain from your meats and your waistline. Being in control of portion sizes makes a difference too. The average dinner plate has increased 33% since 1950 from nine inches to twelve inches. Use the salad plates instead of the dinner plates; it’ll instantly cut down how much food you bring to the table. And since people are visual, it may cut down on your appetite too. Turn cooking at home into a family affair. Have your kids help you choose vegetables from your garden, farmer’s market or store. Have them help you. 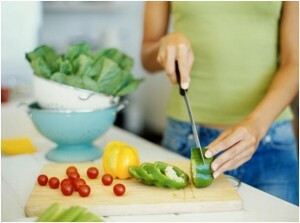 Studies have shown that kids who help prepare a healthy dinner are more likely to eat healthy on their own. And children who regularly eat dinner with their families get better grades at school. In these economic times, price is always a factor. The average cost for a family of four to eat just a basic fast food meal can run between $25- $50, sit down restaurants are even pricier. It will cost about half that to make a much healthier, fat-busting, lesson teaching, family-time-encouraging meals. It’s a win-win-win-win. Swap your white bread for whole grain, same with white pasta for wheat, white rice for brown. Pick the leanest cuts of meat, chicken and fish. Add more fruits and vegetables. Eat the whole rainbow of color, darker vegetables like eggplant and blueberries are full of nutrients. When you must use oil, go heart healthy with olive oil. Cut your salt and sugar by half. Water, drink more of it. With these easy changes and sticking to an exercise plan, before you know it you’ll have to go shopping for a new wardrobe. And you can use all that money you saved by eating at home to do it. *Always check with your doctor first before starting any diet or exercise program. Stacey Cavalari holds a B.A in Communications and currently writes for Viamedic.com , a safe pharmacy for consumers to obtain FDA-approved medications such as Viagra, Cialis and Levitra Online. Stacey uses her communications and research skills to cover health and wellness on the Viamedic.com Blog.